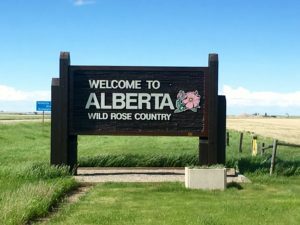 We crossed the border into Alberta, Canada with no issues. 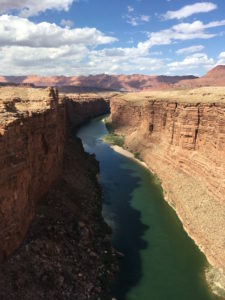 We had heard stories from other RVers and even Jeff’s grandfather, who used to fish in Canada, about hours-long searches. 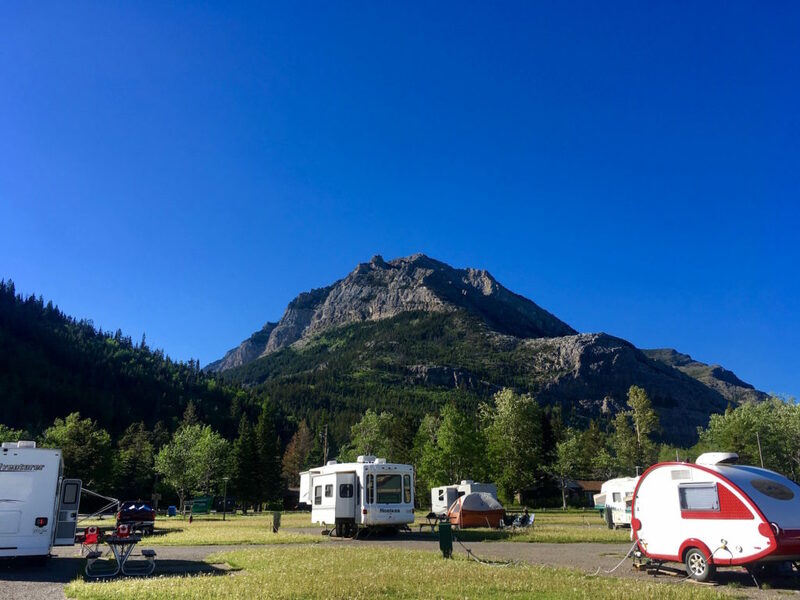 We drove through a lot of rolling farmland and got to Waterton Lake, the Canadian side of Glacial National Park. Our campground was right in the middle of the park, only a few blocks from downtown, but also right on the lake. The view was gorgeous! 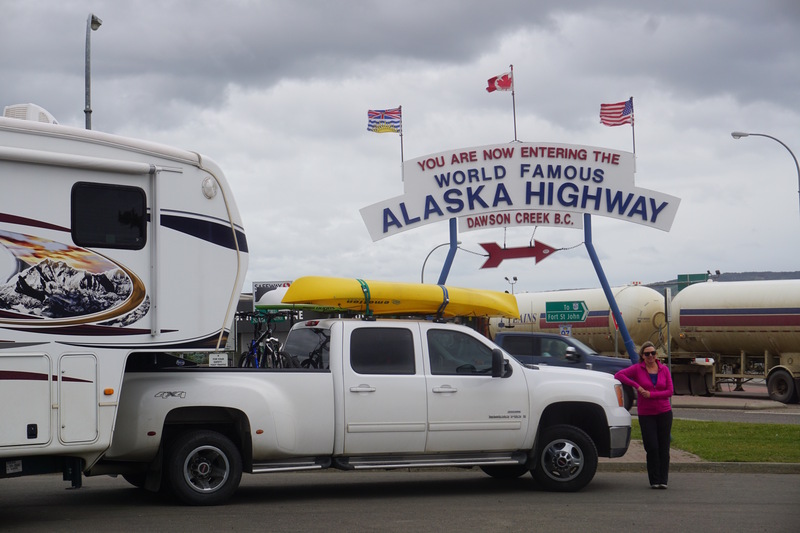 As we met fellow travelers on the road, we realized that Alaska needed to be on our bucket list. We both managed to get 3 months off from work and drove from Montana up through Canada and Alaska over the summer. It was very different from our previous travels because we were truly on vacation and allowed ourselves to do some ‘touristy’ things which were well worth it. That part of our adventure was so amazing it deserves its own book! 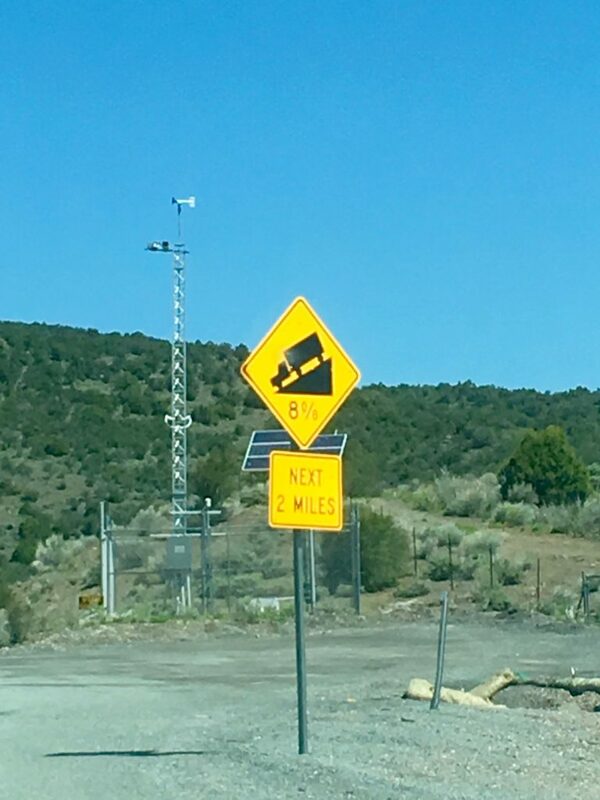 We’ve made the drive from Phoenix to Flagstaff a number of times, but we are still amazed by the effects on vegetation we see as the elevation changes: suddenly, there are Saguaros, then there are not. Then fields of dessert flowers, then not. Then forests as you pass through Flagstaff, then they mostly disappear into the desolation of northern Arizona. 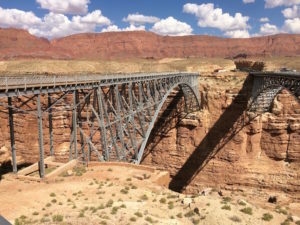 To cross the Colorado River east of the Grand Canyon we went across the new Navajo Bridge over the Marble Canyon. The original bridge is still there, so you can stop and walk across it. Some 466′ above the river! Since Sue’s son and daughter-in-law moved to Denver last December, we decided to re-visit and spend some time in that area this spring. 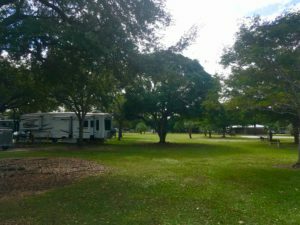 We added two more RV parks to the list of places where we have stayed more than once. Garden of the Gods RV Resort is in Manitou Springs with breathtaking views of Pike’s Peak, and Cherry Creek Park in Denver. 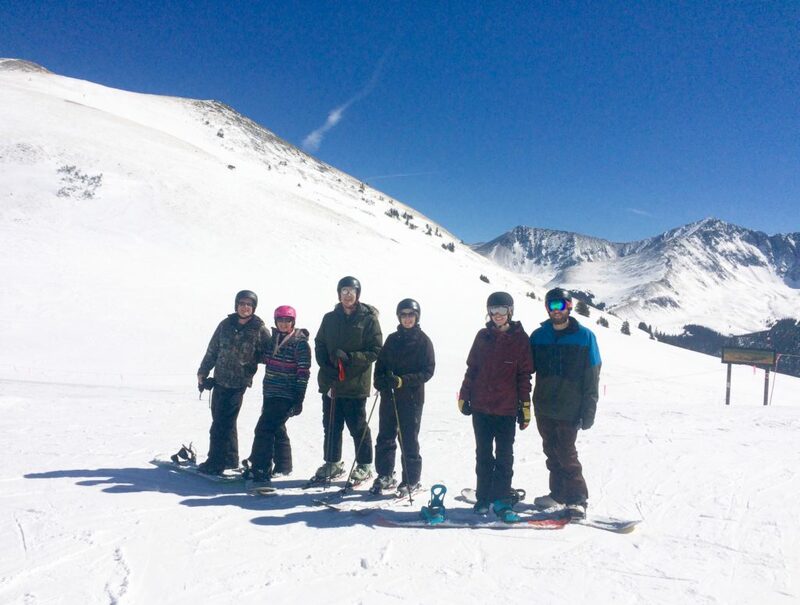 We spent a day at Copper with Jay, Virginia and her parents, Chris and Connie, who we got to see for the first time since the wedding last August. The conditions were excellent but we struggled with the altitude. Talk about feeling old! Sue had another long term work assignment in an area where we could park and stay, reducing the amount of flying she had to do. 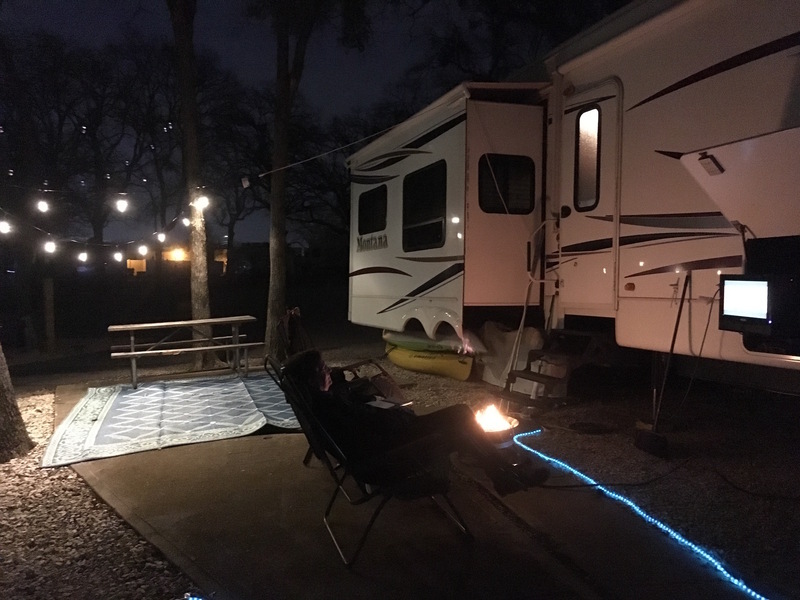 The office is in downtown Fort Worth, but we stayed about 1/2 hour away in Arlington, which is a major bedroom community for the Dallas/Fort Worth area. It’s also where Six Flags Over Texas is, and it was strange for Sue to remember that she had been there with her family when she was about 5 years old. We found a nice, quiet park called Treetops and got a spacious spot for a month with trees all around. The weather was alternately wintery (no snow but freezing at night) and summery (80s). It was a gorgeous night for the Superbowl! Fun watching the game outside: especially for a Pat’s fan! 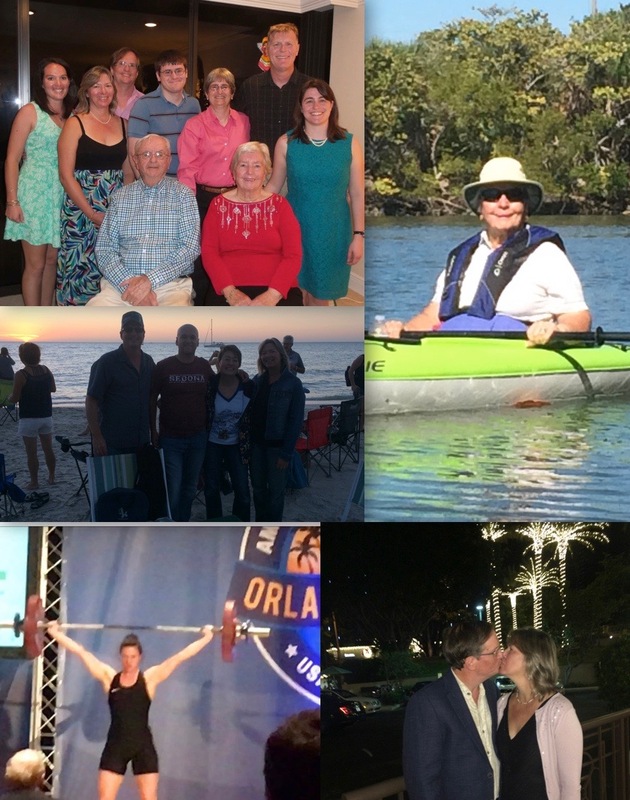 Daughters, parents, family, friends, holidays, birthdays… beautiful Florida weather, kayaks, motor boats, amusement parks, shooting range, golf, RC sailing, fireworks and lots of great food. It is no surprise that our stay in Naples was a special time. 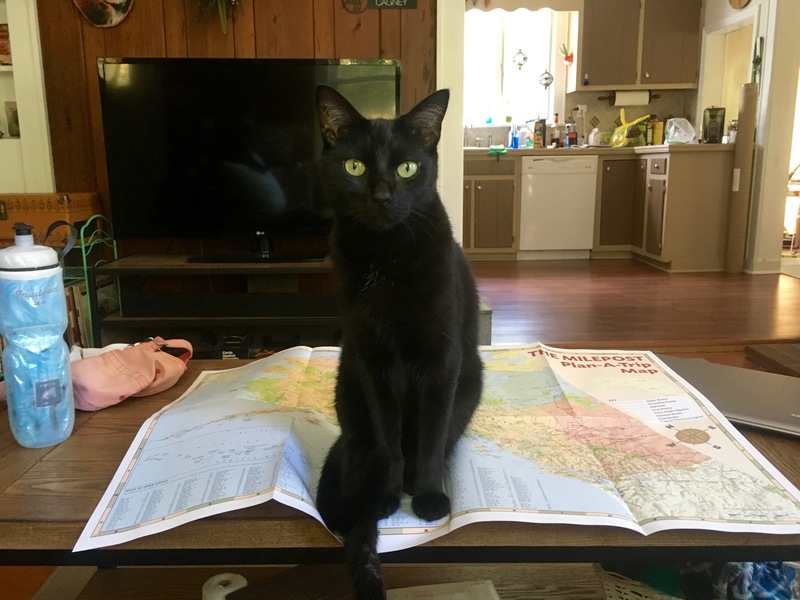 We were initially going to spend a month in Franklin, NC, but at the last minute we spent 2 weeks cat-sitting Nigel and Jeffery while Jay and Virginia were on their honeymoon. Luckily, Monty fit in their driveway so we had easy access to all our stuff. We spent most of the nights in the house so the cats wouldn’t be lonely and experienced the joy of playful, early-rising kitties. Their idea of rising involves knocking the bedroom door down, face-walking and toe-biting. They are very accepting of strangers! Clearly this was a screen shot and I captured my son’s name! The whole reason we came east for the summer was to attend my son Jason’s wedding to Virginia Hall in August. 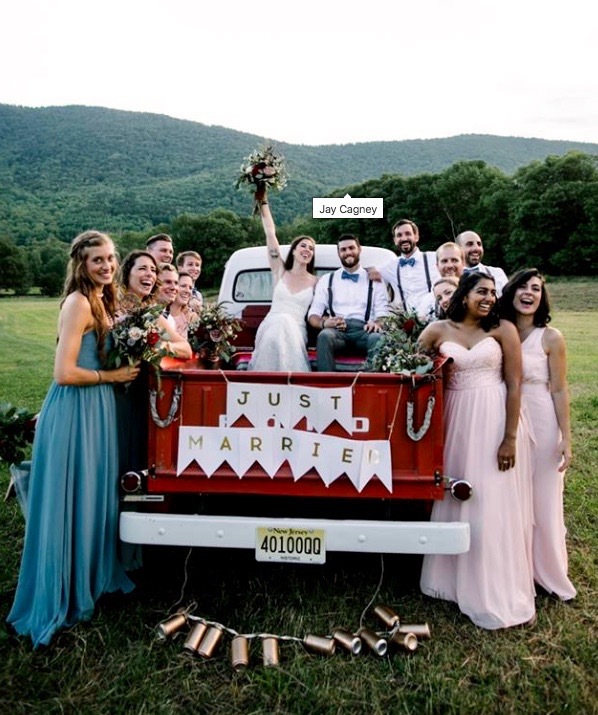 A gorgeous farm in the Catskills had been chosen and we were thrilled to find out there was an RV-friendly campground 2 miles from the venue. We arrived a week early to have some family time with my brothers and their children and grandchildren.